While many American politicians have been accused of pandering to white supremacists, few have done it so overtly, or successfully, as President Donald Trump. Following the white supremacist violence that left one counter-protester dead and many injured in Charlottesville, Virginia, two magazine covers, The New Yorker and The Economist, are highlighting the unprecedented alignment between the White House and those donning the white robes. The illustrations allude to Trump’s complicated relationship with racist and antiSemitic far-right supporters. Although some have accused Trump of personally harboring racist or anti-Semitic feelings, there is little evidence either way about his feelings on these subjects. However, more than a few observers have noted the evident affinity of people with extremist views for Trump, reflecting his opposition to immigration and admitting refugees. The president is clearly at pains to placate and even encourage this part of his base. For example, he suggested a moral equivalency between far-right and far-left protesters in Charlottesville, without crossing the line into explicit statements of support. 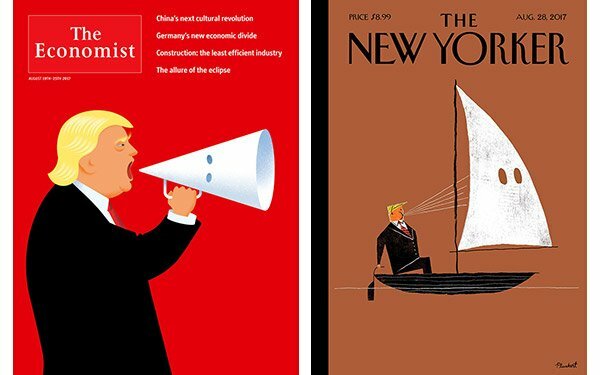 The New Yorker and The Economist covers both alluded to Trump’s carefully calculated handling of the far-right, capturing how he simultaneously benefits from their support — framing and activating it with his own rhetoric — while keeping more unacceptable elements at arm’s length. Both covers used the notorious hooded robe of the Ku Klux Klan to make their point. The New Yorker cover, titled “Blowhard,” shows Trump in a sailboat with a Klan hood sail, propelling himself forward with “wind” from his own speech. (Of course, self-propulsion on sailboats doesn’t really work, which may be why the boat appears to be becalmed.) The Economist shows Trump using a bullhorn in the shape of a Klan hood to convey his message. Again, in both cases, the far right is depicted as a tool used by Trump, rather than a cause warmly embraced by him, encapsulating the carefully balanced strategic ambiguity in their relationship. 1 comment about "Cover Story: 'New Yorker,' 'Economist' Break Out Klan Robes For Trump". Jo-anne Lema from After Fifty Living, Inc., August 21, 2017 at 9:35 a.m. Both The Economist and The New Yorker are to be congratulated. Hmmmm. Thinkin' I just may get a couple of new subscriptions. Just sayin'.